The US central bank has said it will raise its benchmark interest rate citing a strengthened economic outlook. The Federal Reserve said it had decided to raise the rate by 0.25% to a target range of 1.5% to 1.75%. Policymakers also signalled they would increase rates twice more this year, while raising the forecast for rate hikes in 2019. Federal Reserve Chair Jerome "Jay" Powell also sounded a warning about rising trade tensions. The Trump administration recently announced steel and aluminium tariffs and is weighing sanctions against China, actions that have led to threats of retaliation. Mr Powell said some Fed members are worried about the possibility of a trade war, referencing conversations between central bankers and business leaders. "They're seeing it as a risk to the outlook," Mr Powell said at a press conference at the close of the Fed's two-day meeting in Washington. What does the Fed expect? Members of the Federal Open Markets Committee, which votes on rates, predicted the US economy will grow by 2.7% this year, faster than the 2.5% predicted in December. Officials are also expecting slightly higher interest rates in 2019 and 2020 than they did in December, according to projections released after the meeting, which reflect the median of estimates by committee members. "This is clearly a firming up of the future trajectory of policy tightening," said Brian Coulton, chief economist at Fitch Ratings. The Fed has been raising rates slowly since 2015, moving the US away from the ultra-low levels put in place following the financial crisis. The central bank is trying to balance a low unemployment rate with the potential for higher inflation. Economic conditions have also shifted. The US economy grew at an annualised rate of more than 3% during some quarters last year, while the unemployment rate is hovering at 4.1% - the lowest since 2000. A new man takes over the Fed: What will he do? Inflation has continued to lag the Fed's 2% target rate, but analysts have said they expect wages and prices to increase this year. Mr Powell said the Fed is "alert" to the possibility of inflation and expects inflation to rise in coming months, but is not expecting a sharp increase. "There's no sense in the data that we're on the cusp of an acceleration in inflation," he said. An increase in the Fed's benchmark federal funds rate typically leads to higher rates for consumers and businesses. Savers benefit, but borrowing becomes more expensive, which can dampen activity in industries such as housing and car sales and raise costs for businesses that rely on debt. 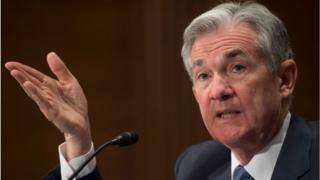 Jerome Powell: Who is Trump's Fed chair nominee?